An overview of materials available for researchers interested in exploring the history of fashion using the Kellen Design Archives. A celebrated portraitist and leader in fashion illustration, René Robert Bouché (1905-1963) was a visiting lecturer at Parsons in 1947. The Kellen Design Archives collection consists of 104 of Bouché's fashion illustrations, as well as a poster from a 1974 exhibition of his work at Parsons. Suzy Lorraine Ehrlich (1919-2006), was a New York-based fashion illustrator and product designer. The collection is comprised of 69 fashion illustrations executed in pen and ink, pastel, crayon, watercolor, and collage. Some illustrations may have been executed for a class taught by Jack Potter at the School for Visual Arts. Carl Erickson (1891-1958), who signed his work "Eric" was a leading fashion illustrator whose drawings appeared in Vogue and Harper's Bazaar, among other publications. In 1964, Parsons hosted a retrospective of Erickson's work, and the Kellen Design Archives collection consists of works from that exhibit. The donor, Juke Goodman, was the art director for Saks Fifth Avenue during the 1940s and served as a critic and visiting lecturer at Parsons from 1949 until 1952. The collection includes illustrations created by René Bouché, Burma Burris, Carl Erickson (Eric), Ruth Sigrid Graftstrom, and Jacqueline Lindner. Fred Greenhill (1925-2007) graduated from Parsons in 1950. He went on to work as a fashion illustrator for Neiman Marcus in the 1950s, and was the primary artist for Saks Fifth Avenue in the 1960s and early 1970s. Greenhill is most recognized for his Lord & Taylor illustrations, including the company's trademark long-stemmed rose. 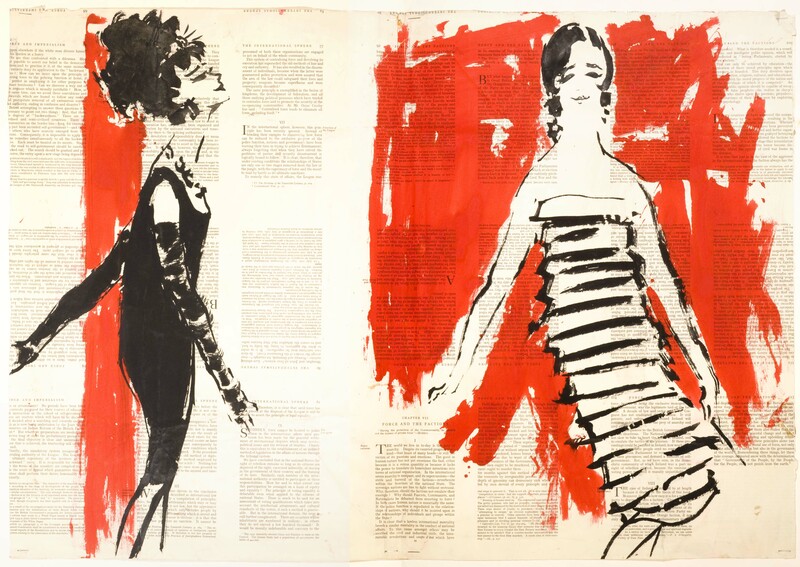 The Kellen Design Archives holds approximately 700 fashion illustrations that Greenhill created from the 1950s through the 1980s. The collection consists of approximately 500 professional illustrations by Parsons School of Design alumnus Bob Hiemstra, from the beginning of the 1980s into the early 1990s, when he produced fashion and spot illustrations for a wide range of magazines, newspapers, cosmetic companies and department stores. Dora Mathieu (1909-1980) taught fashion drawing in Parsons' Fashion Illustration Department, 1964-1966. The Kellen Design Archives holds 29 of Mathieu's sketches, depicting notable designers of the mid-20th century. Although the earliest dated portrait is from 1938, the bulk of the collection was created between 1965-1968. Esta Nesbitt (1918-1975), an instructor at Parsons from 1964 to 1974, created fashion illustrations for such publications as Harper's Bazaar, Mademoiselle, and the New York Times Magazine. Later in her career, Nesbitt employed inventive printing techniques as a children's book illustrator, created performance art pieces, and was one of the earliest to experiment with fine art xerography. Nesbitt's work in the Kellen Design Archives primarily consists of 271 original fashion illustrations, as well as pre-publication layouts, mechanicals, proofs, and tear sheets. Fashion illustrator Michaele Vollbracht (1947- ) graduated from Parsons in 1968, and has since returned periodically as a visiting critic. After working as a design assistant for Geoffrey Beene, Donald Brooks, and Norman Norell, Vollbracht turned to fashion illustration and portraiture. In 1985 Vollbracht published Nothing Sacred, an illustrated memoir, and in 2000 Parsons mounted an exhibition of his work to celebrate the release of the updated version of the book. The bulk of the collection is comprised of fashion illustrations and designer portraits Vollbracht created for a 1972 fashion show celebrating Parson''s 75th anniversary and the establishment of the school's Gimbel Library.